Are you trying to find an easy, homemade strawberry shortcake recipe? Well, here it is! Strawberry Shortcake... and Fond Memories of Youth. Strawberry shortcake is one of those few childhood favorites that becomes even more enjoyable as an adult! 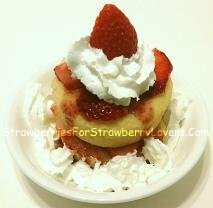 Some people are fans of the more modern, spongy, "yellow cake" shortcake, while others prefer a biscuit-like shortcake (something like the yield from a Bisquick-brand strawberry shortcake recipe). Perhaps the choice is influenced by what you remember eating to cool off on hot June nights when you were only half as tall as you are now? Whichever shortcake you'd like to know how to make, you've come to the right place, because they are both right here! It is best to begin by making the cake. For the Yellow Cake: Begin by mixing together the sugar, oil, milk, eggs, baking powder, salt and vanilla extract. Then add the flour a little at a time to the other cake ingredients and continue mixing until everything is completely mixed. Pour the mix into shortcake pans that make approximately 3 inch (8 cm) diameter cakes (you can find pans like this on the Internet; or you can bake in larger pans and cut the cake to whatever size you like, of course). Bake at 350 degrees Fahrenheit (177 degrees Celsius) for 15 minutes or until you can insert a toothpick into the center of a cake and the toothpick has almost nothing on it when you pull it back out of the cake (longer times are required for larger cakes). For the Biscuit Cake: Begin by mixing together the sugar, milk, baking powder and salt. Next, mix the shortening (or butter, or margarine... whichever you prefer) with the flour, pressing the ingredients together until all of the shortening (butter, or margarine) are completely mixed into the flour. After this, add the flour mix to the milk mix a little at a time until the flour mix has been completely added and you have a roughly uniform dough. Roll out the dough and use an approximately 3 inch (8 cm) diameter cookie cutter to cut out the cakes. Bake the cakes at 350 degrees Fahrenheit (177 degrees Celsius) for 10 to 15 minutes, or until the cakes turn golden brown. Whichever of these strawberry shortcake recipes that you decide to use, once the cakes are cooled, it's time to prepare the whipped cream for the cake. Simply add the sugar and vanilla extract to the heavy whipping cream and whip everything together until the whipped cream becomes stiff. To complete the dessert, simply layer the cakes and strawberries together. Top with the whipped cream (and drizzle with strawberry syrup, if you like) and top with nice-looking strawberries to garnish the desserts. Remember your childhood! And please remember that you found your recipe for strawberry shortcakes here at StrawberriesForStrawberryLovers.Com, Home of the World's Happiest Fruit!